Today, synthetic proteins are increasingly used in chemistry, biology, medicine and material sciences. Chemical synthesis is especially useful when the production of the desired proteins by living systems can be problematic. It is often the case for proteins having unusual architectures or including non-native modifications such as non-coded amino acids, chemical labels or functional handles. Another advantage of chemical synthesis is the possibility to isolate proteins devoid of biological contaminants which might perturb the study of their biological properties. Chemical synthesis has also clearly demonstrated its powerfulness for accessing proteins featuring post-translational modifications at specific sites such as acetylation, phosphorylation, methylation, glycosylation, ubiquitination or sumoylation. Given the potential of protein chemical synthesis in various research and development areas, protein chemists are faced with the challenge of accessing small protein domains (< 250 amino acids) in a more efficient and reliable way. Modern methods for protein synthesis rely on the assembly of unprotected peptide segments in water using chemoselective amide bond forming reactions. The native chemical ligation (NCL), that is the reaction of a C-terminal peptide thioester with an N-terminal cysteinyl (Cys) peptide, is certainly the most popular method for protein synthesis today. Pushing the limits of protein chemical synthesis using NCL requires to overcome several difficulties which are specifically related to the synthesis of the linear polypeptide chain. One important need is the availability of straightforward synthetic methods for producing the individual peptide segments composing the protein, i.e. peptide thioesters and Cys peptides, including very long ones. Another challenge is the design of efficient and robust processes allowing the assembly of the peptide segments in water. SEA chemistry has the potential to address these important limitations. The SEA group has been introduced in 2010 in our Org. Lett. paper. At that time, we were mostly interested in the design of novel methods for making peptide bonds chemoselectively in water. SEA ligation is exactly such a reaction. It involves the reaction of a peptide featuring a C-terminal bis(2-sulfanylethyl)amido group, called SEA, with a Cys peptide. This reaction proceeds perhaps through the formation of a transient thioester intermediate, obtained by intramolecular attack of one SEA thiol on the peptide C-terminal carbonyl group as shown in Scheme 1. SEA group belongs to the N,S-acyl shift systems . Scheme 1. SEA ligation between a bis(2-sulfanylethyl)amido (SEA) peptide and a cysteinyl or homocysteinyl peptide leads to the chemoselective and regioselective formation of a native peptide bond. Ligation proceeds efficiently even in the case of difficult junctions such as Pro-Cys junctions (see the page dedicated to this aspect). We rapidly realized that SEA chemistry allows many more. To see how SEA chemistry can help you making proteins visit the different pages within this section (on the left). If you want to have a quick digest of the potential of SEA chemistry, just stay on this page! One important property is the possibility to convert a SEA peptide into a peptide thioester, which are the key peptide segments for assembling proteins using the NCL reaction. Scheme 2. SEA peptide segments are converted into thioester peptide segments in the presence of an excess of 3-mercaptopropionic acid. Perhaps one of the most important properties of SEA group is the possibility to switch easily between the open dithiol form called SEAon and the closed cyclic disulfide form called SEAoff as shown in Scheme 3. 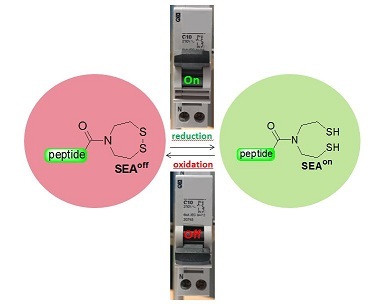 SEAon/off concept enables to design novel sequential assembly methods for protein total synthesis because the SEAoff group can act as a latent thioester during the NCL reaction between a classical peptide thioester and a Cys peptide. In particular, we designed a method to assemble three peptide segments in a one-pot reaction. This process enables the synthesis of proteins composed of up to 150-200 amino acid residues considering the actual limits of the SPPS method (Angewandte). The powerfulness of thie one-pot method was demonstrated by the total synthesis of several functional proteins such as the HGF/SF Kringle 1 domain (Angewandte, Traffic, Chemical Science), the HGF/SF N domain (Biorg. Med. Chem.) and more recently a SUMO-1 peptide protein conjugate (Chemical Science, Nature Protocols). Scheme 5. One-pot three segments assembly process for protein total synthesis in solution. Recently, we extended the concept to the design of a novel solid phase method called SEA SPPS for SEA solid phase protein synthesis (Chemical Science). In the SEA SPPS method, the peptide segments are ligated sequentially on a water-compatible solid support in the N-to-C direction as shown in Scheme 6. SEA SPPS has a great potential for accessing very large polypeptides. Moreover, the solid phase approach gives the opportunity to automate the synthesis. The numerous advantages of the solid phase approach over the solution synthesis are discussed in this review.